Artmosphere, a leading literary, arts and performance parley curated by WriteHouse Collective has consistently provided the needed ambiance for literary, creative and intellectual empowerment in Nigeria. WriteHouse Collective, the parent social enterprise for the idea, Artmosphere is pleased to announce its October edition. This edition is a special open mic edition which intends to discover new voices, and talents. It will headlined by two NNLG mentions, Iquo Eke, author of Symphony of Beginning and Chijioke Umu-Nnadi, author of Through the Window of the Sandcastle. 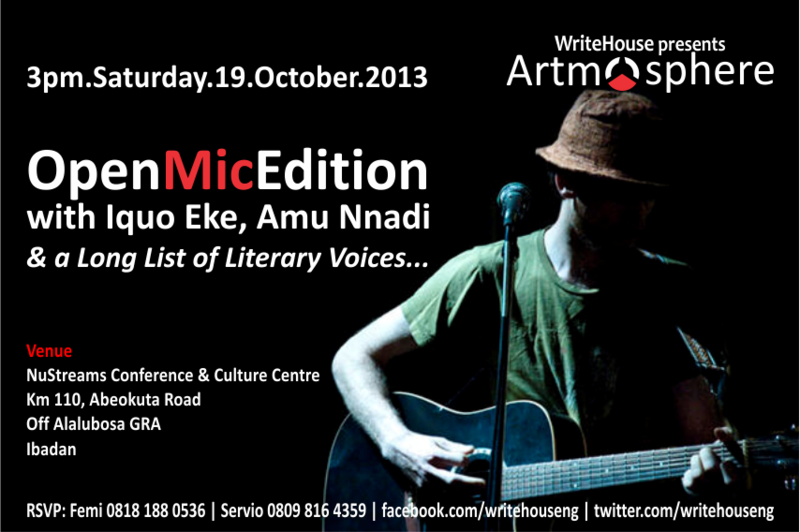 Iquo Eke is a prolific performance poet and the youngest Nigerian long-listed for the NNLG prize. Symphony of Beginning is her debut book, and it can gained critical acclaim as charming and insightful. Chio Amu Nnadi is the author of Through the Window of a Sandcastle. He has twice been recognized as one of Nigeria’s prolific poets. Described as Nigeria’s Dennis Brutus, Umu Nnadi’s poems are profound. This edition intends to delve into a serious discourse on the future of the Arts in Nigeria. With intellectuals and young minds expressing their expectations of the arts, we hope that we can discover answers to baffling questions that has relegated the arts to the background of social, political and economic importance. The mic is open to both young and old minds in this edition. Venue: NuStreams Conference Centre, KM 110 Abeokuta road, Alalubosa GRA Extension, Ibadan. This entry was posted in Art, News/Events and tagged art, artmosphere, arts, event, literature, NNLG, poetry, prose, writehouse, writehouse collective. Bookmark the permalink. Diary Of A Lazy Medic. Just another blog that's supposed to be funny.